Here he is, Dave DePaulis, our grand prize winner of our raffle. 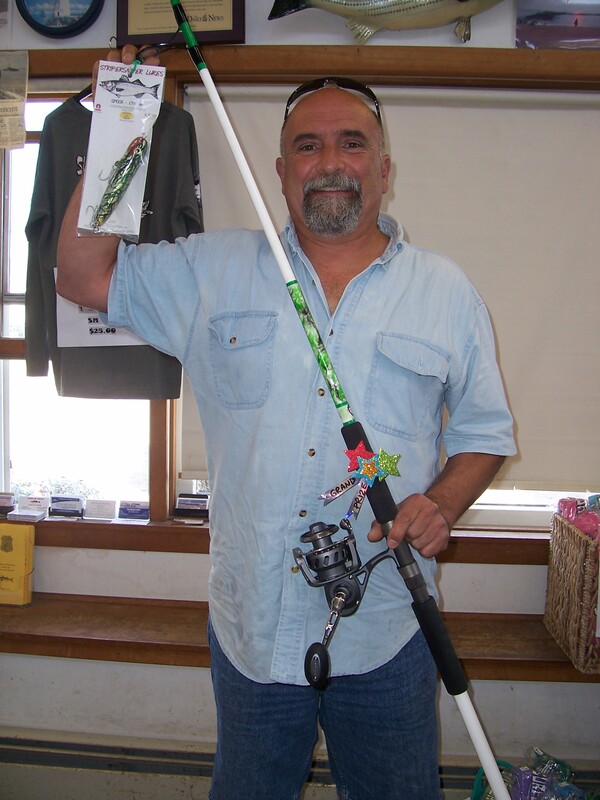 Dave was the lucky winner of the new Van Staal VM150 reel, custom rod made by Mike MacCormack and Surfland, and a matching custom lure from Striper Sniper Lures. The rod was made from a Lamiglass BT1083M. Old school fiberglass rods are becoming popular with the surf fishermen again. Dave was very excited at winning this outfit and kept running his hands up and down the rod lovingly! Dave is one of our beach buggie guys who fish the refuge for the fall striper run. He filled the spool with line, got his bait and headed to the oceanfront to try out the new combo. It just happened that “Skate Slayer” was in at the same time. With a longing in his eyes, “Skate Slayer” watched as Dave left with his prize. Maybe Dave will let him have a go at it down the beach. Congratulations Dave! And thank you for supporting the Nathaniel Bibaud Recovery Fund! Tight lines! Sweet…he’s happy ! Congrats to Surfland again for putting this raffle together for a good cause. I did not win, but enjoyed being in the raffle.